A crisp, passionately argued answer to the question that everyone who's grown dependent on digital devices is asking: "Where's the rest of my life?" At a time when we're all trying to make sense of our relentlessly connected lives, this revelatory book presents a bold new approach to the digital age. 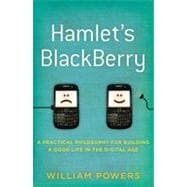 Part intellectual journey, part memoir, Hamlet's BlackBerry sets out to solve what William Powers calls the conundrum of connectedness. Our computers and mobile devices do wonderful things for us. But they also impose an enormous burden, making it harder for us to focus, do our best work, build strong relationships, and find the depth and fulfillment we crave. Hamlet's BlackBerry argues that we need a new way of thinking, an everyday philosophy for life with screens. To find it, Powers reaches into the past, uncovering a rich trove of ideas that have helped people manage and enjoy their connected lives for thousands of years. New technologies have always brought the mix of excitement and stress that we feel today. Drawing on some of history's most brilliant thinkers, from Plato to Shakespeare to Thoreau, he shows that digital connectedness serves us best when it's balanced by its opposite, disconnectedness. Using his own life as laboratory and object lesson, Powers demonstrates why this is the moment to revisit our relationship to screens and mobile technologies, and how profound the rewards of doing so can be. Lively, original, and entertaining, Hamlet's BlackBerry will challenge you to rethink your digital life. William Powers, a former staff writer for the Washington Post, has written about media, technology, and other subjects for a wide variety of publications, including the Atlantic, the New York Times, and McSweeney's. This book grew out of research he did as a fellow at Harvard University's Joan Shorenstein Center on the Press, Politics and Public Policy. A two-time winner of the Arthur Rowse Award for media criticism, he lives on Cape Cod with his wife, author Martha Sherrill, and their son. This is his first book. William Powers has created a wonderful guide to living with these devices that we now worship in the digital age. I enjoyed the textbook from the first page till the last. I think that "Hamlet's BlackBerry" is a great gift for all ages. This textbook is both enjoyable and on target. The textbook was in great shape for being a used copy, great for the money; I will do business with you in the future. You delivered what you said a good product at a good price, before the estimated time! Thanks ecampus. Hamlet's Blackberry: 5 out of 5 stars based on 1 user reviews.